EACH SUMMER, tens of thousands of beach-goers flock to the beaches and sweeping coastlines of Cape Cod, Nantucket and Martha's Vineyard. Far beyond Massachusetts, the name ‘Cape Cod’ has become synonymous with an American family seaside holiday. Although there are certainly more exotic holiday destinations, there are few places that hold the same quaint, New England charm as ‘The Cape’. What is it exactly that makes this crooked peninsula such a magnet for visitors from around the world? 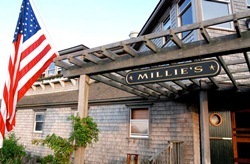 The history and architecture are unique, and Cape Cod abounds with traditional carved signage. These signs - with their gilded scallop shells, sculpted whales and countless other coastal North-eastern motifs – may only be noticed peripherally by the average tourist. On the other hand, for those with an interest in sign-crafting and typography, Cape Cod provides a visual feast of handcrafted signage that is unparalleled anywhere else. The sign-carving tradition in this area started in the days of clipper ships. Back then, by law every ship had to carry a carved nameplate, or ‘quarterboard’ identifying the ship. Flat-painted lettering was not an option, since the paint would surely have faded and eventually worn away, under the constant saltwater blast. by the 1800s even ‘land-lubbers’ took a liking to the carved style of these ship signs, and the industry spread from ships to homes and businesses. In the 1960's there was a hand carved sign revival led by woodcarver Paul White and many sign makers that he taught and tutored. Today, carved quarterboards can be seen on many a Cape Cod house or shop. On a typical quarterboard, the house or business name is carved deeply into the sign, and is often flanked by ocean motifs such as scallops or anchors. Danthonia’s use of HDU (High Density Urethane) offers an environmentally-friendly alternative to wood carved signs.This closed-cell foam, made from partly recycled materials, achieves the same rustic look as wood through a skilful use of paint and carving. HDU offers superior protection from the damaging elements of the sea while maintaining a glossy and bright finish. After all, the mighty trees that were felled for the building of wooden ships aren’t so readily available these days. With over ten years’ experience designing and hand-crafting signs throughout Australia and the United States, Danthonia is already a trusted name in impeccable business sign design. Originally from the United States themselves, Danthonia’s craftspeople are already experts in the rich history and abundant iconography of Cape Cod signs. 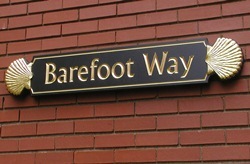 Whether you’re a resident of The Cape or not, a carved sign on your home or business would be a handsome addition. If you are looking for a Cape Cod style sign - have a look at more of our Quarterboards or other Beach House Signs.